Our family is looking forward to reopening in the spring of 2019 for strawberry picking which is then followed by blueberry and raspberry picking closer to July. *You are welcome to sign up for our mailing list on the right hand side of this homepage. This is an email directly from us to you that keeps you informed about each of our growing seasons. 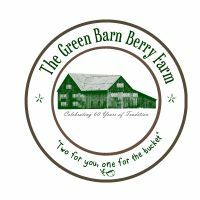 *The Green Barn Berry Farm has been family owned and operated since 1954. Our farm is nestled between the shadow of the Bald Eagle Mountain and along the shores of the beautiful Susquehanna River. Our family takes pride in offering a pick your own tradition of days gone by to all of our customers. The experience will leave you feeling like you truly took a step back in time. Two for you, One for the bucket!